As part of his testimony today, Jim Comey revealed he gave some or all of the nine memos he wrote documenting his interactions with President Trump to a friend, since confirmed to be Columbia Professor Dan Richman, who in turn shared one with the press. COMEY: I asked — the president tweeted on Friday after I got fired that I better hope there’s not tapes. I woke up in the middle of the night on Monday night because it didn’t dawn on me originally, that there might be corroboration for our conversation. There might a tape. My judgement was, I need to get that out into the public square. I asked a friend of mine to share the content of the memo with a reporter. Didn’t do it myself for a variety of reasons. I asked him to because I thought that might prompt the appointment of a special counsel. I asked a close friend to do it. COLLINS: Was that Mr. Wittes? COMEY: A close friend who is a professor at Columbia law school. The fact that Comey released the memo through Richman formed part of Trump lawyer Marc Kasowitz’s pushback after the hearing. Of course, the Office of the President is entitled to expect loyalty from those who are serving in an administration, and, from before this President took office to this day, it is overwhelmingly clear that there have been and continue to be those in government who are actively attempting to undermine this administration with selective and illegal leaks of classified information and privileged communications. Mr. Comey has now admitted that he is one of the leakers. Today, Mr. Comey admitted that he unilaterally and surreptitiously made unauthorized disclosures to the press of privileged communications with the President. The leaks of this privileged information began no later than March 2017 when friends of Mr. Comey have stated he disclosed to them the conversations he had with the President during their January 27, 2017 dinner and February 14, 2017 White House meeting. Today, Mr. Comey admitted that he leaked to his friends his purported memos of these privileged conversations, one of which he testified was classified. He also testified that immediately after he was terminated he authorized his friends to leak the contents of these memos to the press in order to “prompt the appointment of a special counsel.” Although Mr. Comey testified he only leaked the memos in response to a tweet, the public record reveals that the New York Times was quoting from these memos the day before the referenced tweet, which belies Mr. Comey’s excuse for this unauthorized disclosure of privileged information and appears to [sic] entirely retaliatory. Kasowitz gets a lot wrong here. Comey said one memo was classified, but that’s the memo that memorialized the January 6 meeting, not the ones described here. 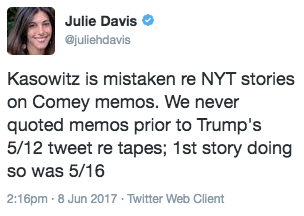 And the NYT has already corrected the claim that the shared memos preceded the tweet. And, as a number of people (including Steve Vladeck) have noted, even if this information were covered by executive privilege, even if that privilege weren’t waived with Trump’s tweet, it’s not a crime to leak privileged information. Nevertheless, Kasowitz’ focus on purportedly privileged documents is all the more interesting given the pathetic conduct of Director of National Intelligence Dan Coats and NSA Director Mike Rogers at yesterday’s 702 hearing. 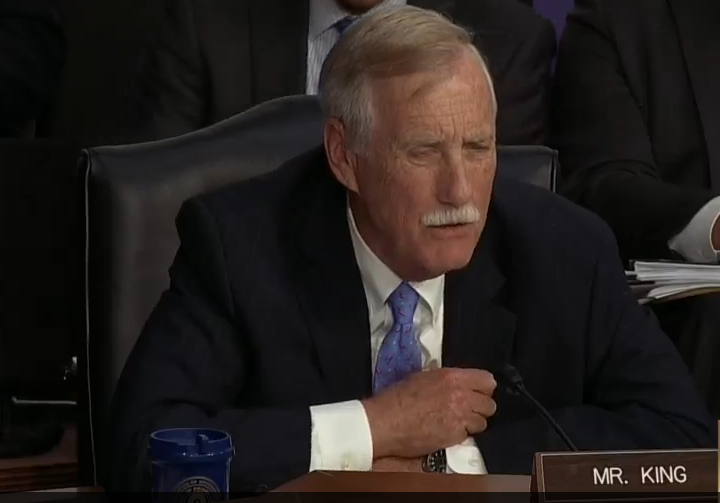 After a great deal of obfuscation from both men about why they couldn’t answer questions about Trump’s request they intervene in the FBI’s Mike Flynn investigation, Angus King finally got Rogers to admit that he and Coats never got a conclusive answer about whether the White House was invoking privilege. King: I think you testified, Admiral Rogers, that you did discuss today’s testimony with someone in the White House? Rogers: I said I asked did the White House intend to invoke executive privilege with respect to interactions between myself and the President of the United States. King: And what was the answer to that question? King: So then I’ll ask both of you the same question. Why are you not answering these questions? Is there an invocation by the President of the United States of executive privilege? Is there or not? Rogers: Not that I’m aware of. King: What you feel isn’t relevant Admiral. What you feel isn’t the answer. The question is why are you not answering the questions. Is it an invocation of executive privilege? If there is, then let’s know about it, and if there isn’t answer the questions. Rogers: I stand by the comments I’ve made. I’m not interested in repeating myself, Sir. And I don’t mean that in a contentious way. King: Well I do mean it in a contentious way. I don’t understand why you’re not answering our questions. When you were confirmed before the Armed Services Committee you took an oath, do you solemnly swear to give the committee the truth, the full truth and nothing but the truth. You answered yes to that. Rogers: I do. And I’ve also answered that those conversations were classified. It is not appropriate in an open forum to discuss those classified conversations. King: What is classified about a conversation about whether or not you should intervene in the FBI investigation? Rogers: Sir I stand by my previous comments. King: Mr. Coats? Same series of questions. What’s the basis for your refusal to answer these questions today? King: What’s the basis? I’m not satisfied with I do not believe it is appropriate or I do not feel I should answer. I want to understand a legal basis. You swore that oath to tell us the truth, the whole truth, and nothing but the truth, and today you are refusing to do so. What is the legal basis for your refusal to testify to this committee? Coats: I’m not sure I have a legal basis. In other words, these men admit they had no legal basis (they’re not classified, no matter what Rogers claimed) to dodge the Committee’s question. But nevertheless they’re invoking things like their feelings to avoid testifying. Clearly, the White House is playing a game here, invoking loyalty rather than law to compel silence from its top officials. Kasowitz’ claims are, on their face, bogus. But taken in conjunction with the dodges from Coats and Rogers, they’re all the more problematic. Trumpy thinks loyalty means Omerta. All executives believe this. Whether in public or private organizations, the management Omerta is the prime directive – violate it and pay the consequences. It is no accident that the only people to have gone to jail (or worse) for the war crimes, bank frauds and torture committed over the past two decades have been the whistleblowers. I wonder if there are “tapes” of Trump’s dinner with SSCI members Cotton and Rubio on Tuesday. We have a huge mess to deal with. Seriously huge. Hell, I can see Russia from the Whitehouse! This is really a bad mess, that has to be unwound, slowly, and carefully. IMHO, the simplest explanation for their tapdance is this: they’ve seen Comey fired and a genius at coverups nominated (Wray, after Trump dangled the odious Joe Lieberman who then withdrew b/c of a “conflict of interest”, about which more anon) to replace him. Assuming these two men are loyal to the Constitution and true-blue, they’ve decided to go along with Trump and force the system to work to get the information out of them, rather than be straight-up with the committee and give direct answers which would get them fired before they got home from the Hill. This, because they know what kind of successors Trump would put into their jobs and what damage those successors could do with those jobs. The problem with that, of course, is pretty straightforward. When dealing with someone like Trump, you’re going to get fired sooner or later, for failing to carry out his latest whim du jour, whatever it might be. It’s like managing the Yankees in the Bronx Zoo days. Every manager who took the gig knew George was going to fire him sooner or later. The difference between the Yankees and the USG, of course, is that a losing streak in baseball will end without appreciable harm to anyone. With the USG, replacing moderate authoritarians with those who’ve sworn a blood loyalty oath to the President and intend to use their power aggressively does damage which can’t be repaired, in the short or in the long term. In other words, these two trying to contain the damage by working from inside the system to undermine or slow down Trump ain’t gonna work. As to Short Ride, I think it more likely he was a deliberate dangle by the Donald, more to get shrieks and moans of pain from his critics (he’s the kind of guy who likes the screams of agony from those he’s opposing) and to ease the way for someone really odious like Wray to get the job. AFAIK, the MSM has not yet picked up on his weaving Christie through the Bridgegate thicket. I could be wrong on Short Ride, i.e., the conflict of interest explanation really meaning he felt himself bound by some sense of lawyerly ethics such that he actually withdrew, but I think he knew it was all wink-and-blink and he’d never get more than the dangle. Trivia homework: What ‘stuff’ links Comey and Winner? Bonus points if you can describe why the connection is not trivial. Both are leakers, both think they are whistle blowers, both moved information off classified systems, both woke up in the middle of the night and decided to do it? Both use Tor? Comey agrees with her tweet “the most dangerous entry to this country was the orange fascist we let into the white house.”? Reality thinks Martha Stewart is a crook too? Please don’t keep us in suspense SLF. NSA. Comey apparently believes the NSA spearphishing report that Winner allegedly leaked. At least his testimony last Thursday sure indicated such. Now, to be fair, his testimony may certainly be based on other NSA reports. But NSA and spearphishing is the common thread. The important question is who is really doing the spearfishing? Are we even sure spearphishing was even a factor? The only source for that theory to my knowledge is NSA. Never heard Crowdstrike speak up. Was the Winner ‘leak’ really real and was it to ‘sell’ to the public and Congress a red herring? But it was reflexively contentious. He caught himself but for an admiral to respond that way to someone who “outranks” him, whether he likes it or not, is concerning, even if he was pinned in a fallacious argument. So I pulled up a WaPo article from November 19 for those who might have missed it in the post election hand wringing. That was two days after the election. Is that when he pledged his fealty? plus, thanks to rick r for the insight into rogers’ behavior. there’s always a reason for what the big fish do, but it is not always easy to ferret out. FOOLS! Our POTUS is always one step ahead ! Ha. Ha! They had the microwaves removed and had them sent to the alternative universe where we shall never see them again. And remember it’s the not fake and POTUS you see in the tinfoil not the F’nPOTUS Spicy man. So, now, there is a USB key. This whole Winner story is making less sense by the day. She is being tried in the media. Seriously doubt the USB key story. That she googled (USB insertion on TS computer) (while still in AF). It should not be possible, USB on a TS computer should be blocked by default. And she would know that, there would be no reason to google for that info. And allegedly she had tor on a home computer. Chain of custody broken on arrest. Several years ago DoD reportedly finally woke up about thumb drives after the Russians (OMG!-snark) used infected ones to compromise air gapped machines when our folks chronically used them to move stuff to/from insecure web facing computers. They apparently had a hell of a time cleaning that up. Think you’re right, Winner would have had to know the score on USBs. It would have been vigorously and repeatedly impressed upon her. Whole damn thing has been fishy from the beginning. Loyalty vs Oath of Office. But by citing Trump’s interactions with Coats and Rogers, Kasowitz may have complicated the intelligence officials’ ability to avoid testifying publicly about the matter in the future as Congress investigates issues of obstruction of justice. There was no EP to start with, as both Rogers and Coats fully admitted in their testimony. Agree. It is the ‘avoid testifying publicly’ angle that may be important later. What may not be mentioned in the article, even though there was clearly no executive privilege invoked, is this: Even in a closed session, executive privilege still applies. Clearly, these men just didn’t want to get fired by stating something openly. If EP could still be applicable in any hypothetical closed session (likely depends on circumstances), maybe this is why SJC wants Sessions to testify in open session. It may actually be to his benefit. Comey and Friends Expected Jeff Sessions to Recuse by February 14 Sessions Recusal: Election And/Or Russia?